OLD DETROIT NEWS FILM CREW vintage black and white photo picture print for sale. This sepia toned Detroit Motion Picture Crew photo is made from the vintage historic rare Original 1927 black and white photograph showing the film crew in action. 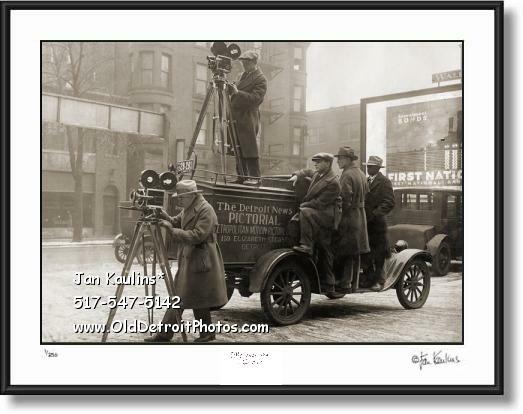 On the side of the custom vehicle (notice platform on which the top camera man is standing) is painted 'THE DETROIT NEWS PICTORIAL METROPOLITAN MOTION PICTURES 159 Elizabeth Street Detroit'. This is a wonderful period image rarely seen of the actual filming crew with their 'state of the art' motion picture cameras on assignment in Detroit during 1927. Three associates stand on the running board watching the action.